According to a 2018 survey by Gartner, CEOs report a growing focus on changing and upgrading the structure of their companies, including prioritizing IT-related issues and scaling up their digital business initiatives. Growth remains number one, but there is a shift from focusing on incremental growth to creating foundational change to become more competitive and support long-term growth. Image: Gartner, Inc. as included in a press release on 5/1/18. 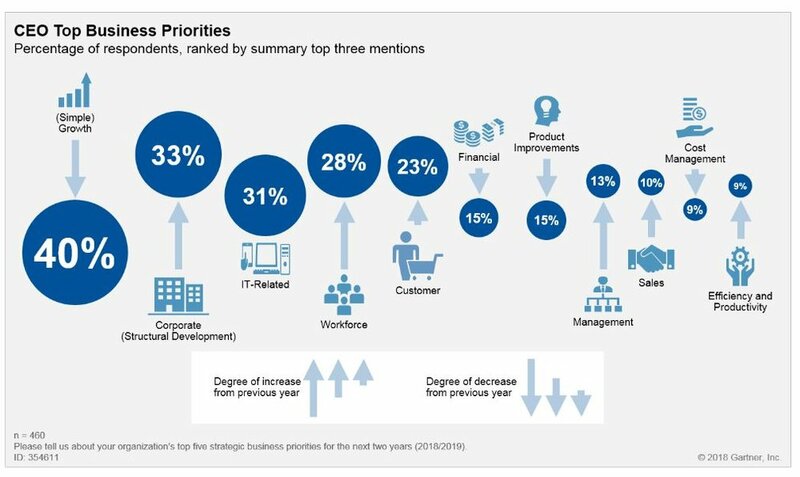 Growth has always ranked first in this annual survey of business priorities, however, this year it fell from 58% in the 2017 survey to 40% in 2018, suggesting a real shift in thinking by CEOs. Mark Raskino, vice president and Gartner Fellow explains: “This does not mean CEOs are less focused on growth, instead it shows that they are shifting perspective on how to obtain it.” In other words, they are mentioning a shift in focus to strategies and tactics they believe will make them more competitive and support growth. The corporate category, explains Gartner, includes actions such as new strategy, corporate partnerships, and mergers and acquisitions. This rose to become the second-biggest priority further indicating CEOs are looking to take different paths to growing their companies. Finding the right tech solutions is a high priority for CEOs, coming in at the third position. CEOs mention digital transformation, in particular. Digital transformation uses digital technologies not only to create efficiencies, but also to transform a service into something significantly better. In fact, this is mentioned so frequently, it appears many CEOs are betting on digital initiatives to help drive growth. It is not surprising with the low unemployment rate that workforce rose to become the fourth-biggest business priority, up from seventh in 2017. Specifically, lack of talent and workforce capability were cited as constraints to company growth, particularly when it comes to technology and digital initiatives. While more and more businesses look to technology and digital transformation to try to achieve sustainable growth, Raskino warns, “… superficial digital change can be a dangerous form of self-deceit. The CEO's commitment must be grounded in deep fundamentals, such as genuine customer value, a real business model concept and disciplined economics." He also advises that culture change is a key aspect of digital transformation and when companies have a digital initiative they are more likely to embrace deep cultural change. One could argue that these types of cultural changes, such as empowering employees and being more tech-centric, will make companies more attractive to talent and help them address their fourth highest business priorities! If you are interested in learning more about how Sinu can help with day-to-day tech support and maintenance so you can focus on strategic digital initiatives, then contact us and learn how Sinu can supplement your current IT department to help increase your department's capacity, productivity, and creativity.